We don’t blame anyone for predicting or exaggerating news of Alex Rodriguez’s demise. The New York Yankees slugger entered a phase of decline in his age-36 season, which seemed right for a player then in his 18th MLB campaign. However, the Yankees still owed A-Rod more than $140 million, and the huge obligation all but guaranteed him a lineup spot for the coming seasons. In 2016, with his contract winding down and management scrambling for answers on offense, A-Rod can’t hide behind the money anymore. The unceremonious break with tradition began June 27 in a game versus the Rangers at Yankee Stadium. Texas, reeling from the loss of three starting pitchers, was forced to call up a not-imposing Chi Chi Gonzalez from the farm and set him loose for the opener of a four-game set. At any other point in time in A-Rod’s career, he would have been batting cleanup with a high probability to do damage against Gonzalez. Yankees GM Brian Cashman and manager Joe Girardi both assured reporters at the pregame press conference that the decision wasn’t permanent and neither would use the p-word, but A-Rod’s splits against righties make a platoon the natural fit for a club that has been starved for offense all season. At the start of play on June 28, A-Rod was hitting .200 with 5 HR and a .584 OPS in 115 at-bats versus right-handed pitching. 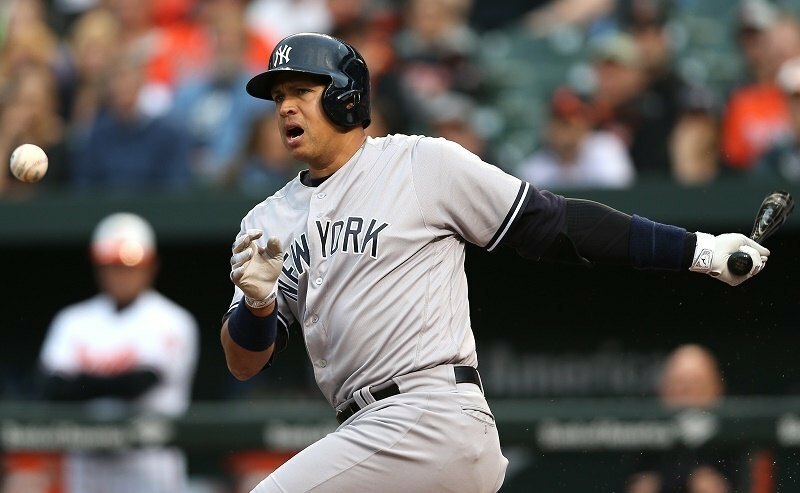 Versus left-handers, A-Rod had a .275 average with 3 HR and .837 OPS in 51 at-bats. There is no sugarcoating the discrepancy, and the Yankees plan to put Carlos Beltran at DH versus lefties, against whom the 39-year-old switch-hitter posted a .294 average with 12 HR and a .873 OPS. This club needs a boost on offense any way it can get it. On paper, the decision could hardly be any easier. With Beltran looking less mobile in right field by the day, New York plans to play Aaron Hicks there to upgrade on both offense and defense with one lineup switch. 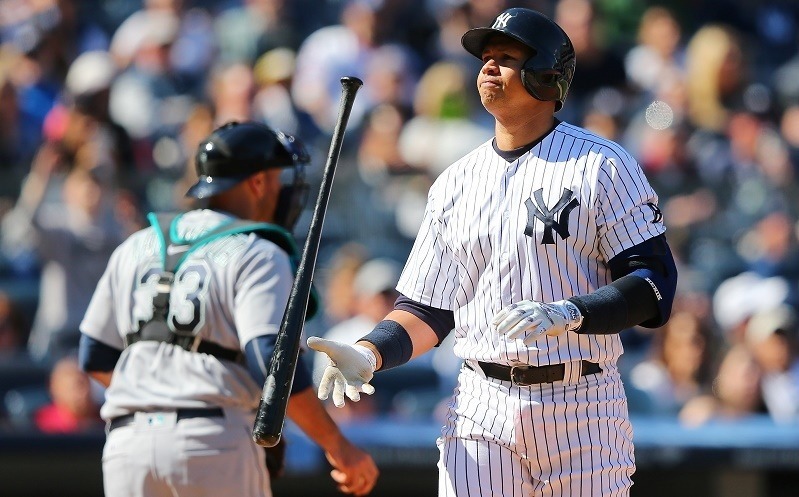 A-Rod’s stint on the bench during a 2012 playoff matchup against Detroit prompted a similar reaction from fans and the media, but that was the beginning of the decline. With only one-and-a-half years left on Rodriguez’s record-setting contract, the Yankees would be more willing to cope with the financial ramifications of a release or buyout. Yet A-Rod is adamant about his ability to find the groove again before that day comes. Acknowledging that he was “surprised” to be sitting at the start of the Rangers series, A-Rod vowed he would return to form. “Look, there’s a lot of baseball to be played,” he said, according to Newsday. “You haven’t heard the last of me.” Unfortunately for him, time is running out for the Yankees as the team struggles to establish itself as a contender or enter the trade season as a seller. With June gone, New York had about three weeks to make its point. Everywhere you look up and down the Yankees lineup, you find underachievers. Chase Headley, Mark Teixeira, Starlin Castro, and Brian McCann struggled mightily during the season’s first half, but each showed signs of life heading into the All-Star break. Among designated hitters, A-Rod ranked 17th of 18 players with more than 170 plate appearances in 2016. Couple this with an inability to play any position, and he has become the odd man out in Girardi’s lineups. Would the Yankees be willing to eat $30 million and move on from one of the game’s most prolific hitters? This move never seemed like an option before he made his way to the bench with the Yankees unable to get over the .500 mark. Now he has become a liability when two-way players could take his spot in the batting order. A-Rod can’t hide behind a mammoth contract and the burden it creates for ownership. For the world’s most valuable franchise, it may mean the difference between grabbing a wild card spot and ending up in fourth place. Faced with that decision, parting ways with A-Rod for $30 million sounds like a bargain.